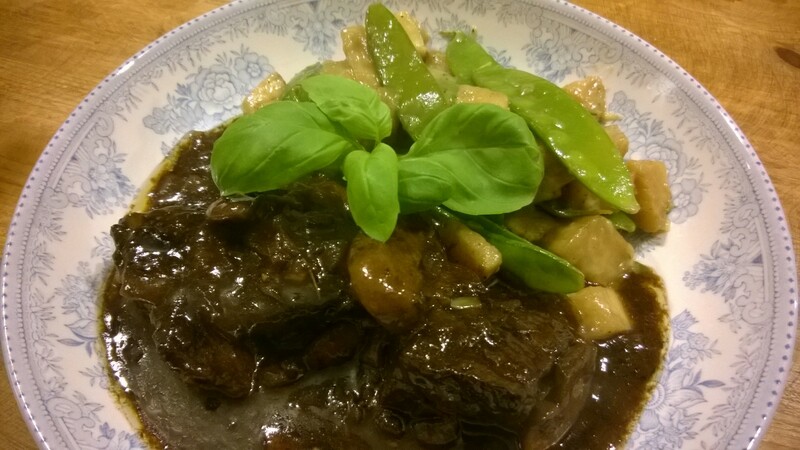 Classic Beef Bourguignon with Celeriac & Mange Tout – low carb perfection! Anyone who says that a low carb diet is difficult to follow is obviously not doing it properly! Take this dish for example… Generous chunks of 30-day matured beef, sautéed in butter then slowly simmered in red wine with garlic, mushrooms and herbs. Few things could be more delicious or more appetising! There’s a reason that this dish has been so universally celebrated for so long… quite simply, it’s perfection itself! Because it’s very low in carbs, this dish is ideal for diabetics and ketogenic-dieters alike. You never know, paleo-fans or gluten-intolerants may want to give it a go too. The more the merrier! The name bouguignon takes its roots from the French red wine of Burgundy, where the dish originates. The wine is soft, velvety smooth and rich in flavour (most definitely my favourite!). Without this, purists would argue that it can’t be called a bourguignon. In all honesty however, any good French red will yield equally pleasing results; they’ll just lack the authenticity and a bit of the smoothness of the original. Don’t be put off by thinking this may be too complicated. The dish itself couldn’t be simpler. All you need is good quality ingredients and a reliable heavy-based casserole. When people refer to French cookery, they don’t mean a list of complex ingredients or fiddly, time-consuming recipes. They’re actually referencing a way of cooking. French cuisine is a methodology; a time-honoured discipline, designed to bring the best out of ingredients. When the French refer to the ‘art of cookery’; art in French means type or style. The ‘French-style’ requires the mastery of a few basic techniques which, once learnt; will deliver consistently outstanding results. One of these competencies is the classic French method of cooking meat. There’s a stately ritualism to this process, which is almost comforting in its cadences. The succulent sealing-in & caramelisation of the meat is followed by the slow softening of shallots & garlic; then deglazing the pan with a magnificent whooshing ‘sigh’, as wine hits the thirsty metal-surface of the pan. As the kitchen fills with the delicious aroma of melting butter, fresh herbs and pan-seared meats, you’ll begin to feel like an alchemist creating pure gold from the very simplest of ingredients. It’s truly an art worth learning! Start by sealing your beef. This must be room temperature and dry to the touch. Heat a metal-lined sauté-pan on the hob (non-stick doesn’t deglaze with pleasing results) and throw in a knob of salted butter followed by a dash of oil. The sizzle should be a rewarding sensation in itself, as should the aroma. Add your beef to the pan and seal on each side until it’s golden brown and deliciously caramelised. You must excuse me for constantly repeating myself, but it needs to be said…! Do not fuss around with the meat in the pan or move it until it’s good and ready. No-one likes to be mothered; why do it to your dinner?! When the beef is ready to be turned, it will release itself of its own accord in response to the merest touch with finger or wooden-spoon. If it sticks, it’s not ready. We want the meat to caramelise and brown; not steam! And do not crowd it in the pan or the same will happen! Once the meat is beautifully golden on each side, lift out of the pan and tip in sliced shallots & chopped garlic. Soften these until translucent and just starting to brown, then add sliced mushrooms and simmer these until coloured. Once done, crank up the heat as high as you can. This is not some obscure act of retribution, you simply want the pan to be as hot as possible for when you pour in the wine. That way, you’ll deglaze with the maximum effectiveness, lifting all the caramelised flavours straight off the bottom of the pan. Once it’s good and hot pour in a large glass full of red wine, making sure to stand over the pan and enjoy the cloud of sweet, alcoholic steam which billows beautifully out into the kitchen! Once the liquid has all but evaporated, place your beef back into the pan and pour in a enough beef stock (or water and stock cubes) to ensure that the meat is just submerged. Dissolve a small teaspoon of Dijon mustard into the pan and add a bay-leaf or two for warmth. Simmer for 10 minutes then stir in a good handful of chopped parsley, place the lid onto the pan and put the casserole into a medium oven for 1-2 hours (the slower the better!). In the last hour of cooking, prepare your celeriac. Peel ‘the big ugly’ and dice into 1cm chunks. Add a spoonful of butter to a broad pan and sauté the celeriac for a couple of minutes on a medium heat. Finely slice an onion and a clove of garlic then add these to the pan and cook for a couple more minutes until the onion starts to soften. At this point, pour in chicken stock (or water and some stock cubes) until the liquid just covers the vegetables. Season well and simmer for circa 40 minutes more until the liquid had reduced and the celeriac starts to break down when pressed with a wooden spoon. If you like, you can add a handful of grated cheese. Cheddar, emmental or gruyere would be perfect. Take the pan off the heat and garnish with a sprinkle of herbs. Remove the casserole from the oven and place onto the hob on a very low heat. In a mixing bowl, add one small teaspoon of cornflour and whisk in enough water to form a thin ‘pourable’ paste. Make sure to whisk sufficiently to avoid any lumps. These will ruin the sauce and be unpleasant to eat. You may wonder at the addition of flour for a low carb diet. Cornflour is an incredibly potent thickener. The amount you’re using will provide only a tiny quantity of carbs, circa 5-10g for the whole dish. Per portion it will only be a couple of grammes! If you’d rather leave it out, I’d quite understand, but as everything else is very low in carbohydrate, I don’t see this small sacrifice as a problem – the results will be worth it! Stir the cornflour paste into the beef and simmer for a minute or two until the sauce thickens. All that remains is to ladle the bourguignon into bowls and spoon on your celeriac mix. Few dishes could be more luxurious and resplendently rich than this one. Be sure to enjoy every last mouthful. We certainly did! 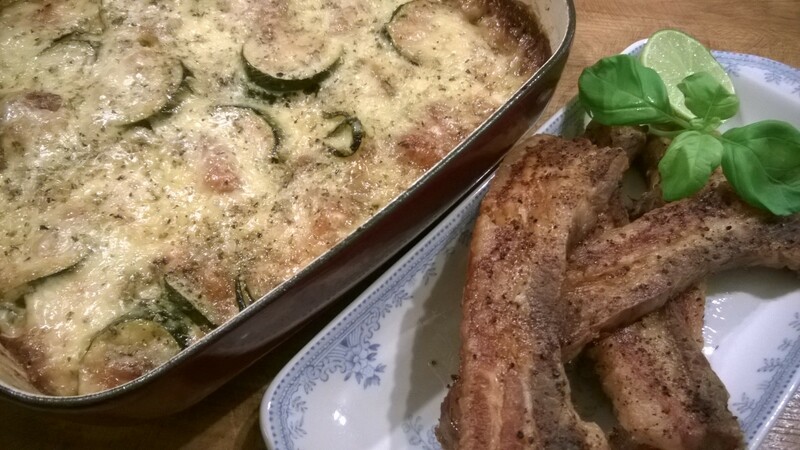 Creamy Bacon, Mozzarella & Courgette Bake with Oven Roasted Pork Loin – the best of a low carb diet! Anyone on a ketogenic diet will soon learn to appreciate courgettes as a delicious, reliable staple. They’re incredibly adaptable and can be used in an infinite number of dishes: zoodles, roulade, rosti, or equally a simple weeknight recipe such as this; courgette & mozzarella bake. Courgettes pick up the favour of anything they’re cooked with, so garlic and bacon form the perfect backdrop for this rich and velvety smooth dish. The zucchini turn buttery soft in the oven, and baked mozzarella complements this wonderfully. Melted cheese is mouthwatering at the best of times – here it blends into the cream to form a decadent, indulgent sauce which is truly delicious! Because the gratin is so smooth in texture, I’ve teamed it with roasted pork belly. This goes wonderfully crisp in the oven, and serves to contrast and counterpoint the softened courgettes and cream. The combination is incredibly moreish – we had no leftovers whatsoever, all plates were scraped clean! This is music to any cook’s ears; as such, this dish comes highly recommended. Start by sautéing diced bacon in a thick-bottomed gratin-dish or casserole. I used butter and a drizzle of oil to prevent the butter from burning. Add a finely sliced onion and cook until this starts to turn translucent. At this point add chopped garlic and 2 large sliced courgettes (one per person). Continue to cook these on the hob for 5 minutes or so, until the courgettes start to brown and soften. Meanwhile heavily season your pork belly strips and place onto a baking tray. Oven bake these at the top of the oven until they go crisp and succulent. This should take circa 30-40 minutes in a hot oven. Once the pork has gone in to roast, crumble a couple of chicken stock-cubes into your sautéing courgette mix for background flavour. Then stir in double cream until the whole lot is just submerged. Dice mozzarella and mix this in so that it’s evenly distributed throughout. Season well and top the lot with a large handful of grated hard cheese such as cheddar or parmesan. This gives the dish that delicious brown ‘crispness’ on top. A quick sprinkle of dried herbs, then into the oven it goes for circa half an hour until the top is golden and bubbling. Once all is ready, serve up the lot whilst still piping hot. You can also serve salad or green vegetables alongside if you like, but one thing is definite: big hearty bowlfuls are a must! There’s no better way to enjoy comfort food like this, so huddle up warm and dig in! 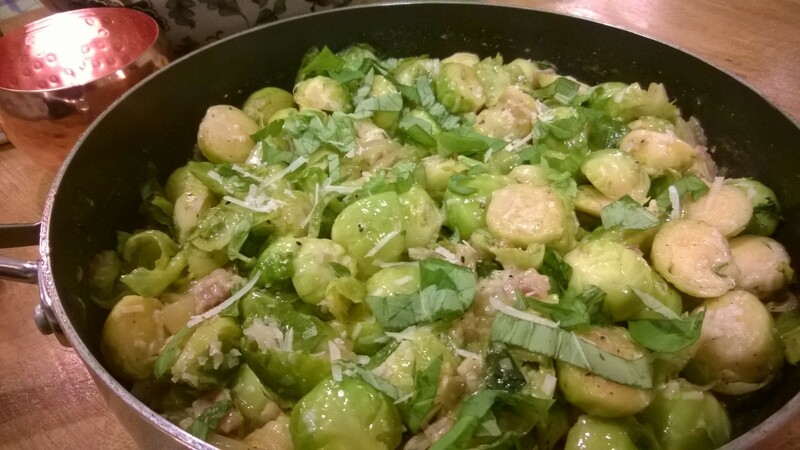 Buttered Bacon ‘Brussels’ with Parmesan – the perfect low carb winter vegetable! Winter fare should be rich, hearty and plentiful – and that naturally includes delicious side dishes and interesting ways to prepare vegetables. Brussels sprouts are a perfect example of how a relatively ‘plain’ vegetable can be transformed into a thing of wonder with a simple twist in its preparation. Around Christmas time ‘brussels’ are in abundance, so take advantage of the seasonal glut and try something a little different from the norm… You won’t regret it! I must admit that I’ve never been a particular fan of sprouts! That’s until I prepared them in this way – richly sauteed in butter and garnished with a generous grating of parmesan. They retain a delicious peppery ‘nutty’ bite, sufficiently tasty to win over even the toughest of ‘anti-sprout-protesters’! Give this recipe a go and you’ll soon see what I mean. Once tasted, you’ll never prepare them any other way! Sprouts are a great green vegetable for a low carb diet. At around 5-6g net carbs per 100g, they’re brilliant for diabetics and those on a keto- or paleo-plan. They’ll be no impact to your blood-sugar and they’re packed with micronutrients, making them supremely ‘good for you’, as well as being a perfect keto-friendly foodstuff. Start by dicing smoked bacon and adding this to a heavy-based saute-pan with a large spoonful of butter. Cook this until it starts to colour, then add a finely sliced onion and a crushed clove of garlic. Continue to saute these until the onion is soft and translucent. Meanwhile, prepare your sprouts. Cut off the tough base stalk and halve the individual sprouts lengthways. The tougher outer leaves will fall off, which is no problem – simply discard these as the inner leaves have a much nicer texture. Once ready, add your sprouts to the pan and turn up the heat. An extra spoon of butter will help to soften them as they cook. Pour on a centimetre’s depth of white wine or vermouth, then crumble in a couple of chicken stock-cubes. These provide a background warmth which ’rounds off’ the flavour and combats any acidity. Simmer the brussels for about 20 minutes until tender or until the liquid has evaporated. Season well, then stir through a generous grating of parmesan cheese and chopped basil. Tumble into a serving dish and rush to the table whilst still piping hot. Delicious! 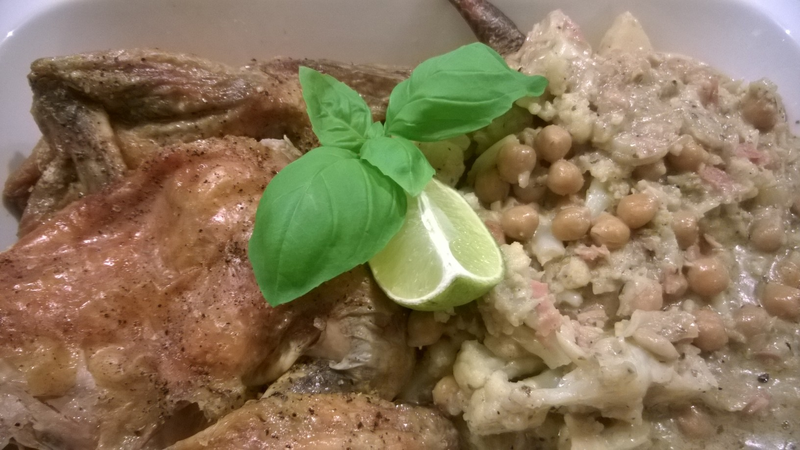 Roasted Guinea Fowl with Cauliflower & Chickpeas in a Cumin & Coconut Sauce – low carb and delicious! Guinea-fowl is a wonderful thing – beautifully simple to cook and absolutely delicious to eat! Its taste echoes the rich depth of flavour found in pheasant, but lacks the ‘gaminess’ which many people find off-putting. There is also none of of the dryness which can plague game, or poultry like turkey. For this reason, it comes highly recommended and if you haven’t tried it before, I strongly urge you to give it a go. You won’t be disappointed! Because guinea-fowl has a richer flavour than chicken, it can carry the weight of stronger tasting accompaniments. For this reason I’ve chosen to pair it with cumin, coconut, lemon and a slight hint of chilli. These serve to ‘lift the denseness’ of roasted meat and provide a cleansing ‘zing’ to the palette. To provide a little textural variation, I’ve also added chickpeas. These have a slightly higher carbohydrate content than other keto-friendly vegetables (circa 10-11g net carbs) so they should therefore be consumed in moderation. They’re packed with micronutrients however, plus they have a lot of dietary fibre; so are a nice addition to the low-carb repertoire if used sparingly! In spite of the chickpeas, this dish is brilliant for diabetics and those on a ketogenic diet. What carbohydrate there is, is slow-release; so it won’t impact your blood sugar. Paleo-dieters can also dig in, as can those with a gluten-intolerance, because this dish is gluten free! No excuses therefore, so dig in! Start by roasting your guinea-fowl. Very little fussing is necessary. If you wish to insert a peeled onion and a dessertspoonful of butter into the cavity , then this can only enrich the dish. There’s no need however; it tasted wonderful when I did it without, so it’s up to you. Season your guinea-fowl all over, then place it breast-side down into an oven-dish. Roasting it upside down for the first hour will mean that all the fat and juices sink down into the breast, preventing it from being dry. Once golden and brown on the underside, turn the meat over and re-season the top, making sure to provide enough salt that the skin crisps up and turns a fine, succulent bronze. This will take a further half hour to 45 minutes. Peel and slice an onion, then sautée this in a little butter & oil, making sure that the butter doesn’t brown. Add chopped garlic and chilli, volume dependent on how strong you like things. Soften these until the onions are translucent. Then add a generous dessertspoonful of cumin powder. Whilst this is filling the kitchen with a heady aroma, chop your cauliflower and tumble it into the pan. Drain a can of chickpeas and add half of this to the pan, saving the rest for another day. If you have a higher carbohydrate threshold than circa 20g a day, then feel free to add the whole can! Then pour on a centimetre depth of water and season. Whilst the water is reducing, open a can of coconut milk (make sure it’s full fat) and add this to the pan. I also like to crumble in a couple of chicken stock-cubes for ‘warmth’. Take the guinea-fowl out of the oven (it should be golden brown and succulent) then transfer to a pre-heated serving dish to rest. Add any roasting-juices to your cauliflower-pan – this will add richness and depth of flavour. Then cover the bird well with tinfoil so that it doesn’t get cold. Meanwhile continue to simmer your cauliflower mix on a low heat for 10 minutes or so, until the coconut milk starts to thicken. Add a tablespoon of desiccated coconut for texture and body, then stir and give the sauce a good taste. Depending on how much chilli you’ve put in, the dish will probably need a little sweetening. Xylitol is very much the low-carb, diabetic-friendly sweetener of choice. It’s 100% natural, doesn’t lose its sweetness in cooking (unlike tabletop sweetener) and behaves exactly like granulated sugar. I couldn’t praise it enough! Once the taste is adjusted to your preference for sweetness & seasoning, remove from the heat and add a generous squeeze of fresh lemon juice. Spoon the cauliflower mix onto your serving dish beside the guinea fowl. Make sure to pour over any delicious sauce left in the pan – this is no time to scrimp! Finish the dish with a generous handful of chopped herbs (coriander or basil are just perfect). Then simply enjoy! Well, I’m eleven weeks in now. Just to remind you all, I started the ketogenic diet at 15 stone, 10 pounds. My goal is 12 and a half stone, by mid-March 2015. This means a target weight-loss of 2lb per week. 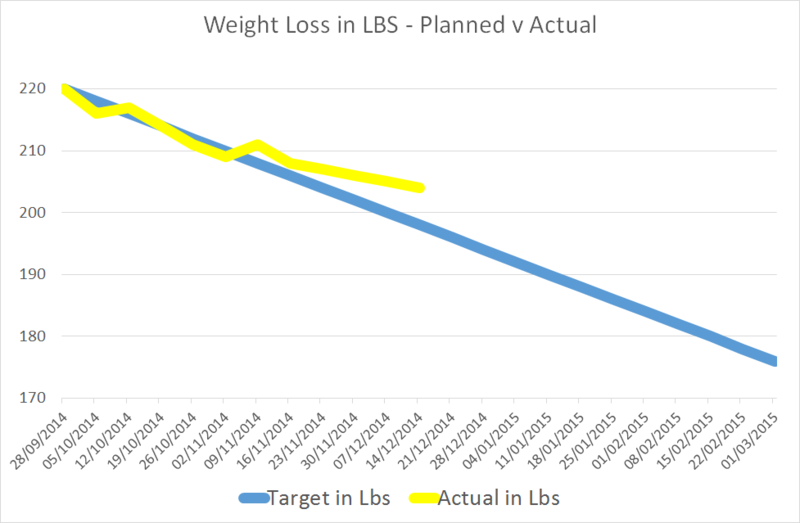 Week Eleven’s target-weight therefore? 14 stone, 2 pounds. Waistline measurement only once a month, so not this week. This morning the ketone-strips tested negative so I think I’ve pushed myself out of ketosis. Knowing how volatile the pounds and ounces can be, I step tentatively onto the scales… Can just one day’s cheating be reflected in weight…? 14 stone, 8 pounds. That’s another pound off! The downward trend continues and this week’s reading presents a 1lb weight-loss from last week. 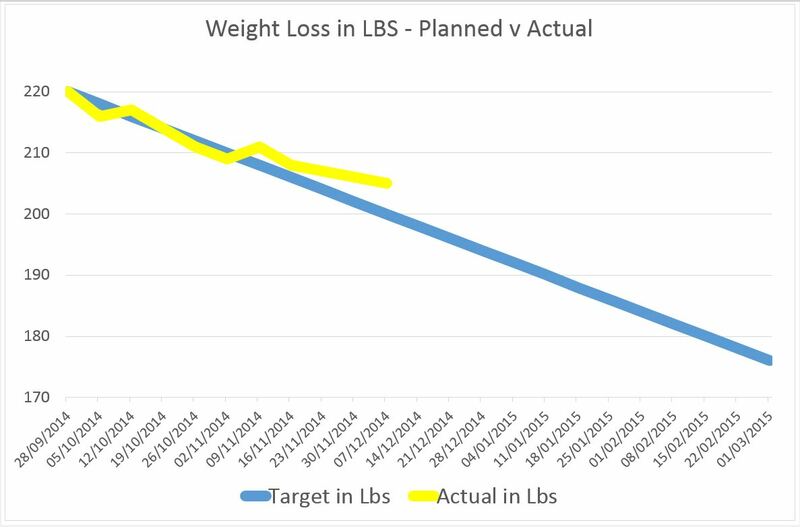 The ‘1lb pattern’ seems to have settled into a routine over the last four weeks, so I’m pleased. I’m officially 6lb behind target, but as I’ve stated in previous posts, I’ve accepted that speed is not an issue. As long as I’m losing weight, that’s all that counts. I’m now 1 stone & 2 pounds lighter than I was eleven weeks ago. This is a brilliant feeling – I’m now just about 14 and a half stone – that sounds so much better than 15 stone 10! Being on holiday is hard on a diet – not because the food on a ketogenic regime is unappetising, simply because cooking it is so much harder. Out of necessity a large number of meals are consumed in pubs and restaurants, where one never truly knows what one’s eating, irrespective of the waitresses’ assurances. The holiday-apartment also only seems equipped to cook the most basic of meals – boiling pasta etc (not keto-friendly!). I have a lot of kitchen equipment at home – things like a food-processor to make cauliflower-rice and a spiraliser to do courgette-noodles. None of this exists in the holiday-flat; even fresh coffee is difficult! Add to this, the large store-cupboard of ingredients I have at home. I can make cakes and sweet things, but on holiday I don’t really want to go to all the expense of buying things in for just one week. We wouldn’t use half of them, and I’d have to end up binning food which I hate. In short therefore; a ketogenic diet relies 100% on real home-cooked food, when the ability to do this is curtailed, things become more of a challenge! In spite of that, I’m here to have a good time. If I gain a pound or two over the week, then that’ll be no real problem – I can always lose them again! I didn’t come to Germany to spend my entire time in the kitchen, so some compromise is in order. I’m still highly motivated to achieve my goals (holiday or no holiday) – the plan is a long-term thing; so ‘short-term’ is simply a temporary obstacle! Please do ‘look in’ on me next week to see if I make further progress towards my targets. Or there’s always the alternative that I’ve gained a few pounds! Either way, I find it really positive to have people read this – the support is a massive encouragement! We may not be guaranteed a white Christmas, but that’s all the more reason to bring the magic of a snowy white winter to life in the kitchen. These delicate coconut and chocolate pots perfectly capture the essence of Christmas food and will lend the festive table a touch of icy sparkle. As magnificent in taste as they are in appearance; this dish delivers an air of elegance and sophistication which delights & enchants on all levels. So give it a go and let me know how you get on! This recipe is truly a symphony of contrasts. The dark chocolate richness of the cocoa brownies is set off beautifully by the brilliant white of coconut. The velvety smoothness of the syllabub is interrupted & heightened by the dense chewiness of cake. And the zing of Malibu coconut-rum lifts the sumptuous creaminess of the mousse. It’s a dish of perfect balance; for that reason I cannot praise it enough! Because there’s no sugar or flour, this pudding is wonderful for diabetics, ketogenic-dieters, and those with an intolerance to gluten. And because they’re so simple to make, they’ll remove some of the ‘cooking pressure’ from your shoulders, and can be made well in advance. Given the frantic busyness of Christmas, this is a huge bonus to cook and kitchen alike! Start by making the brownies. Measure 4oz of xylitol sweetener into a bowl. I always use xylitol in baking. In my experience, it’s the only sweetener which retains its sweetness once cooked; and its granular texture means that it behaves exactly like sugar in cake-recipes. Cream this with 4oz of unsalted butter, then mix in 2 beaten eggs. When smooth, fold in 2oz of ground almonds, 2oz of dessicated coconut, a half-teaspoon of baking-powder and 1oz of good quality cocoa. The texture should be a spreadable, if reluctant dropping-consistency. Line a 9×7 inch baking-tray. Spread the mix so that it covers the bottom of the tray. Bake in a moderate oven for circa 20 minutes until the cake is resistant to the touch and springs back when pressed. I’d have a quick check after 15 minutes – the trays’ shallow depth and large surface area will mean this cooks quickly! Remove from the oven and place on a wire rack to cool. Meanwhile, prepare your coconut topping. This requires coconut milk and gelatine. People can often be a little shy of gelatine, as they think it’s fiddly and difficult to use. This couldn’t be further from the truth. Make sure you buy a good quality leaf gelatine; you’ll have no problems and quickly realise how easy it is! Start by soaking gelatine leaves for 5 minutes in cold water. Four leaves will make a pint of mix. Once they’ve soaked, drain the water and squeeze out any excess liquid with your hand. Set a 1/4 pint of water on to simmer, with 3oz of sweetener. Once this is almost at the boil, remove from the heat and stir in your gelatine. Empty a can of coconut-milk (400ml) into a jug and whisk until smooth. Add 3-4 tablespoons of tabletop-sweetener and a good glug of Malibu coconut rum. Pour your gelatine into this and whisk again, to incorporate all together. Break your chocolate cake into bite-size pieces and arrange covering the base of your serving dishes. You can either use individual glass bowls as I have, or make a larger trifle in one big bowl. Sprinkle a further teaspoon of Malibu over each portion of cake, then ladle your coconut/gelatine mix over this until your reach the top of each bowl. If the sponge floats to the surface, don’t worry; this lends visual appeal and creates ‘texture throughout’. If you’d rather keep it classically ‘layered’, ladle on a little of the mix and set this in the fridge for 20 minutes first. After that you can top up the pots as above, but the set layer will keep the cake from rising up and give you a pretty ‘striped’ finish. It’s entirely up to you which effect you go for; I must admit that I chose the path of least resistance! Place your bowls in the refrigerator to chill over night. In the morning, they’ll be beautifully set and luxuriously smooth! 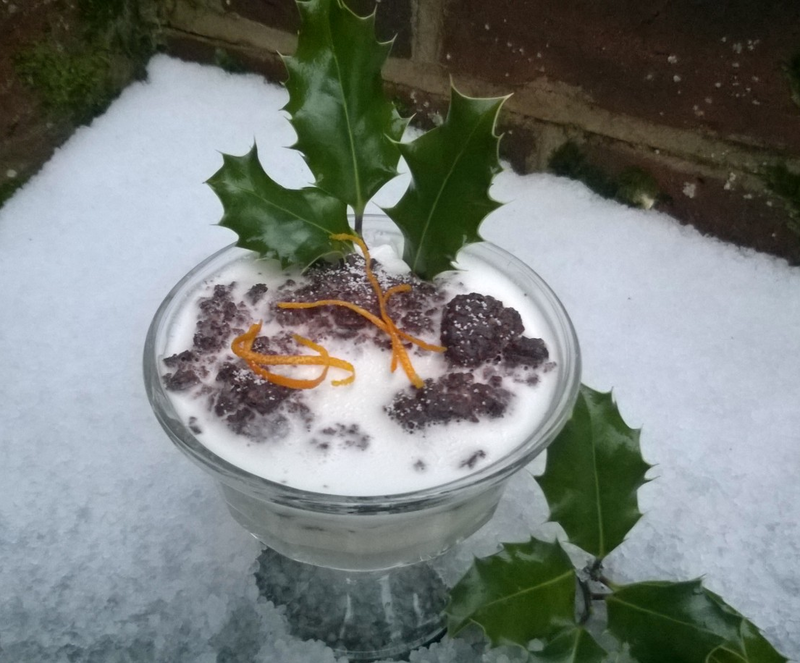 Decorate with a sprig of holly and some strands of orange zest for colour et voila! Your pots are complete. Simply take to the table and serve up with pride! Food comes in many forms. In the Summer, I sit against the obelisk, feeling the warmth of its sun-baked stone on my back; devouring food of a different kind… soul food. I dine on Dostoyevsky, Dickens and Donne. I gorge on Keats, Coleridge and Camus. I devour the pages of Austen, Bronte and Chaucer with a hunger that has nothing to do with my stomach! But in the Winter this must be done by the fire. The cold grey stone is icy to the touch; scant comfort it affords at the time of year… Treasures such as A Winter’s Tale, A Christmas Carol and The Children of Green Knowe are consumed by flickering flame; tucked up warmly in the radiance of the hearth’s glowing embers. 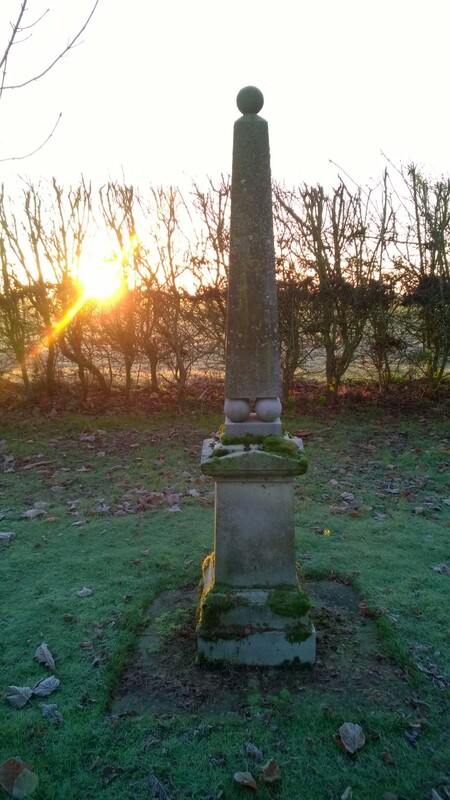 As I pass the obelisk on my morning walk, I pause and run a hand across its mottled, mossy surface. The stone almost burns with cold. The huge golden sun which hangs resplendent in the sky can’t compete with Jack Frost’s meddlesome mischief! Whatever you get up to today, be sure to wrap up warm, for it is icy, icy cold. 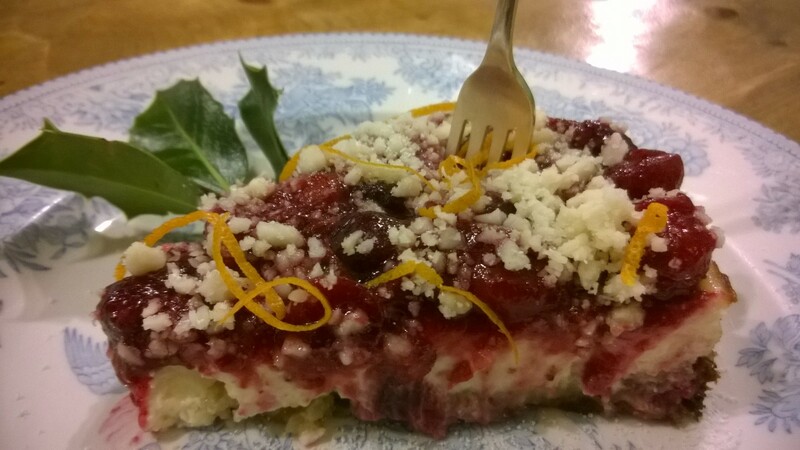 The Low Carb Christmas – Velvety Spiced Cranberry Cheesecake with Toasted Macadamia Crunch. The ultimate Christmas pudding! Even if Christmas were every day, I don’t think I’d ever tire of eating this! Some recipes are truly perfect, and this is one of them! I’d definitely recommend serving this on Christmas day itself, because it’s so special. The vibrant colours make it one of those true ‘centrepiece dishes’ and it will do even the most decadent of festive tables proud! I highly urge you to try this – you won’t be disappointed! Cheesecake is one of those things where texture is everything! In this recipe, the cheesecake-layer itself is velvety smooth, which contrasts wonderfully with the dense biscuity base and crunchy macadamia topping. The creamy vanilla richness is balanced to perfection by the slight ‘tartness’ of cranberry; plus the light dusting of spice in the almond-base delivers that all important festive feel. You couldn’t hope for a more delicious Christmas dish than this! There are some low-carb puddings that taste like ‘diet food’. Take my word for it; this isn’t one of them! Who’d have thought you could eat cheesecake and still lose weight? It’s things like this that make a ketogenic-diet a true pleasure to follow. And because it’s made with Xylitol & ground almonds, they’ll be no impact to your blood-sugar. As a result, it’s diabetic-friendly and an excellent choice for those with an intolerance to wheat. First of all, make your cranberry topping. Take circa 300g of fresh cranberries and add to a thick-bottomed saucepan. Into this, zest the rind of one orange and pour in a couple of tablespoons of water. Place this on a slow hob to simmer until the cranberries begin to break down. At this point, pour in a good glug of port to add richness. Keep the pan on the simmer until the mix has thickened to a dropping consistency, that’s still spreadable. You mighty be wondering where the sweetness comes from… Once the reduction has achieved the right texture, take the pan off the heat and sprinkle in circa third- to half a cupful of table sweetener. Other than Xylitol, most sweeteners lose their sweetness with heat. Adding it at the end, once the mix is a little cooler; means that you can use a less expensive sweetener and adjust the level slowly to suit your preference. Once the topping is as you like it, transfer this to a broad bowl to cool down. To make the cheesecake-base, take a teacup full of ground almonds and half a cup of dessicated coconut. Mix this with half a cup full of Xylitol and a small teaspoon of mixed cake-spice. Then pour in double-cream until the mix clumps together but is not ‘wet’ (circa half a cup…?). The mixture should be shape-able. Press the mix into the base of a buttered spring-form tin, making sure to bank some dough up against the sides. The aim is that this forms a watertight seal in the tin, and prevents the cream-cheese mix from leaking out. Bake the base in a medium oven for 15-20 minutes, or until it’s very slightly brown and feels ‘just set’ to the touch. Empty 2x 200g packets of cream-cheese into a large bowl and crack in two eggs. Add half a cupful of Xylitol and a further half cup of double-cream. Now shake in a good half-teaspoon of powdered vanilla seeds, a teaspoon of essence, or the equivalent of one pod. If you use liquid essence, be sure to read the ingredients list, as this often tends to contain sugar-syrup. Whisk the mixture until ‘divinely smooth’ and give it a taste. It should taste rich, creamy, fragrant and perfect. Ladle the cream-cheese mix lightly on top of your base. Bake in a medium oven for 25 minutes, then turn the oven down to low and bake for a further 20 minutes. You want the mix to wobble very slightly when the tin is nudged, but not appear liquidy. It should only bear very light traces of brown on top. If golden or cracked, then you’ve regrettably cooked it a little too long or too high! All is not lost however; the joy of this recipe is that the topping will cover any surface-inconsistencies, so any flaws will be artfully hidden! Leave the cheesecake to cool until room temperature, then remove from the tin. Refrigerate for one hour until lightly chilled. It’s important to make sure that the mix is truly cold and set, or else spreading the topping will ‘carve’ the surface, which would be a dreadful shame! Spoon the cranberry mix all over the surface, then spread with a palette-knife. Once nice and even, take a handful of macadamia nuts and pulse in a food-processor until the pierces are of a size you can sprinkle. Toast these very lightly under the grill then sprinkle the top liberally to deliver that all important crunch. Transfer to your serving-plate and drape the top with zested orange to garnish. Then carry smugly and majestically to the table, to be demolished with pride! Once cut into, you can guarantee that everyone will want seconds. When food is this good, who can blame them…? 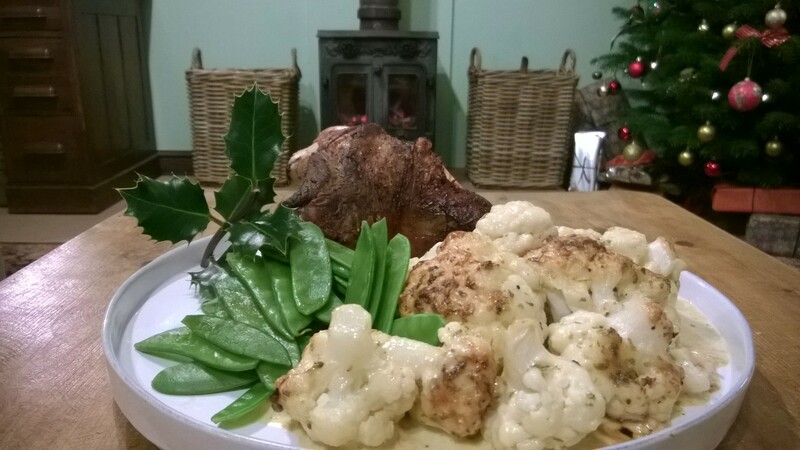 The Low Carb Christmas – Port-Braised Leg of Lamb with Stilton Cauliflower Cheese & Greens – a mouthwatering alternative to turkey! I absolutely adore turkey, but sometimes we all feel like a change. Slow-roasted leg of lamb is a grand substitute; and every bit as splendid! If you’ve already planned & sorted your main Christmas meal, you can equally prepare this for Boxing Day or New Year’s eve; whenever you have hungry mouths to feed and feel like something that little bit special! The joy of roast lamb is that it’s ‘at its best’ when left to slow-cook in the oven for a good few hours. The meat is mouthwateringly tender and falls off the bone at the merest suggestion of a fork. A fine crust also develops, which gives that sublimely succulent juxtaposition between unctuously soft meat & salty, crispy topside. Because the flavour of lamb is so rich, it needs an accompaniment which can hold its own and not compete in flavour. 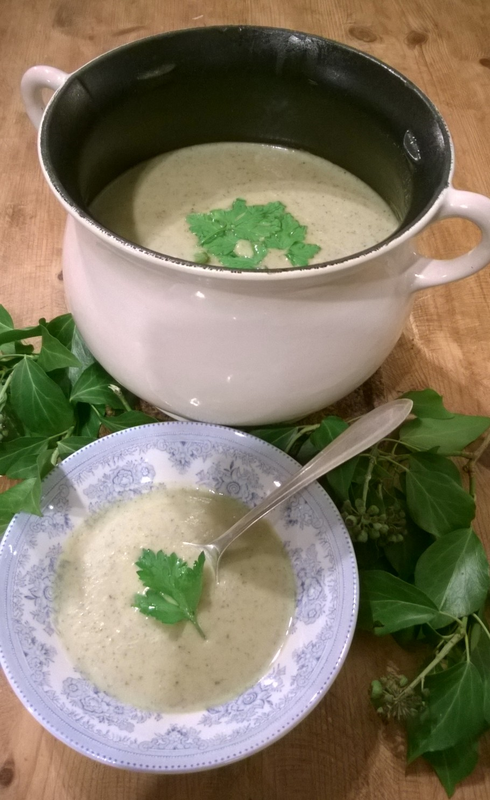 Festive Christmas stilton is the perfect thing for this! It complements the lamb beautifully and has a depth of taste which is second to none. If you can’t get hold of stilton; any rich creamy blue-cheese will work well. But stilton has always been linked with the traditional English Christmas – I give it pride of place therefore, and make every effort to use it as much as possible! Other than the cauliflower and accompanying vegetables, there is virtually no carbohydrate in this meal. This makes it perfect for diabetics, ketogenic-dieters and those who avoid gluten due to intolerance or preference. The cheese-sauce is a cream-reduction, so contains no flour. All you get therefore is sumptuous, rich decadence, which can be tucked into with gusto! Start by roasting the lamb. Salt & pepper all sides then place a thick-bottomed casserole onto the hob to heat through. When the pan is good and hot, drizzle in a little oil, then sear your lamb. You want to cook this on each side, until lightly golden all over. Once done, transfer to a hot oven to continue sealing for 20 minutes. After this time, transfer back to the hob and add roughly quartered shallots and a bay leaf. Whilst it’s still searing hot, deglaze the pan with a generous glug of port and reduce this to half its volume. The cloud of steam is worth enjoying – few things could get you more in the Christmas spirit than the scent of port and roasting meat! Pour on a cup of water, place the lid firmly on the pan and transfer to a slow oven for minimum 2 hours (I always go for 4-6 on a really low heat). You’ll know the lamb is cooked when the meat starts to ‘give’ in response to slight pressure from a wooden spoon. The odour should be savoury and delicious, filling the house with fine festive flavour. If the lamb has not crusted sufficiently on top, turn up the oven and continue to cook for a further 20 minutes with the lid off. This will complete the browning and reduce whatever liquid remains in the pan to a thick gravy. Meanwhile, wash and cut your cauliflower into large florets. Bring this to the boil for two minutes, then strain and tumble into a roasting dish. As the cauliflower is coming to the boil, make your low-carb bechamel. This couldn’t be simpler. Pour a large cupful of double cream into a thick-bottomed pan and crumble in a good handful of stilton. Place on a slow simmer, adding the chopped herb of your choice (I like sage) and a healthy grind of pepper. Once the stilton has completely melted and the sauce is thick and robust, pour this over your cauliflower and then sprinkle with a little grated cheddar to brown. Into a hot oven it goes for 20 minutes until bubbling, golden and delicious on top. During this time, steam your green vegetables then toss in a little butter. Lift your lamb onto a pre-warmed serving-platter and pile your vegetables to one side. Spoon the cauliflower cheese liberally around the plate, pouring on any sauce that remains in the roasting-tray. The meat juices and port-reduction make a wonderful gravy to accompany the dish. You’ll find there’s nothing you need to add to this – the flavour will be deliciously deep and profound just as is! Rush the dish to the table & serve up to the ravening hoards. You’ll probably find you don’t even need a knife to cut the lamb – a spoon will more than likely suffice as the meat falls away in chunks. Few things could be more mouthwatering than this! Just the thing for a rich Christmas feast, when all you desire is perfection! The richness of a ketogenic-diet is a wonderful thing, but sometimes the palette needs a little break from all that cream! Especially at Christmas time, when every meal is a feast in proportions and weight! These bright gin & tonic jellies are just what’s required to lighten things up! They’re fresh in taste and a true delight to the eye. The simplicity of this dish will add a stately, refined elegance to the festive table, and serve as a tonic to the tastebuds. Because there’s no sugar, this pudding is perfect for diabetics, ketogenic-dieters, and those with an intolerance to gluten. And because they’re so simple to make, they’ll remove some of the ‘cooking pressure’ from your shoulders, and can be made well in advance. When making these, I strongly recommend pouring a stiff gin and tonic for yourself. What more do you need to get you in the festive spirit…?! Check out my perfect gin and tonic post, to get the best from this wonderful keto-cocktail! People can often be a little shy of gelatine, as they think it’s fiddly and difficult to use. This could not be further from the truth. Make sure you buy a good quality leaf gelatine, that’s crystal clear. You’ll have no problems and will want to start using it time and time again, it’s so easy! I use raspberries here to complement the clean freshness. Fruit is not great on a ketogenic-diet, but a few certainly won’t hurt. You could also use cooked cranberries, but there’s a danger their juice will spoil the clarity. If you go for that option, make sure to rinse them thoroughly and pat dry with kitchen-paper. That way, you’ll minimise the potential for them to leach into the setting jelly. Start by soaking gelatine leaves for 5 minutes in cold water. Four leaves will make a pint of mix. Once they have soaked, drain the water and squeeze out any excess liquid with your hand. Set a 1/4 pint of water on to simmer, with 3oz of sweetener. Once this is almost at the boil, remove from the heat and stir in your gelatine. In a jug make up 3/4 of a pint of strong gin and tonic, being sure to pour yourself one at the same time. Obviously for diabetics and those on a low-carb weight-loss programme, be sure to use low-calorie / sugar-free tonic water. Pour your G&T into the gelatine mix and stir well. Leave this somewhere cool for 10 minutes to give the setting a head start. This dish works incredibly well in delicate glass-bowls, champagne glasses or wine-glasses alike. 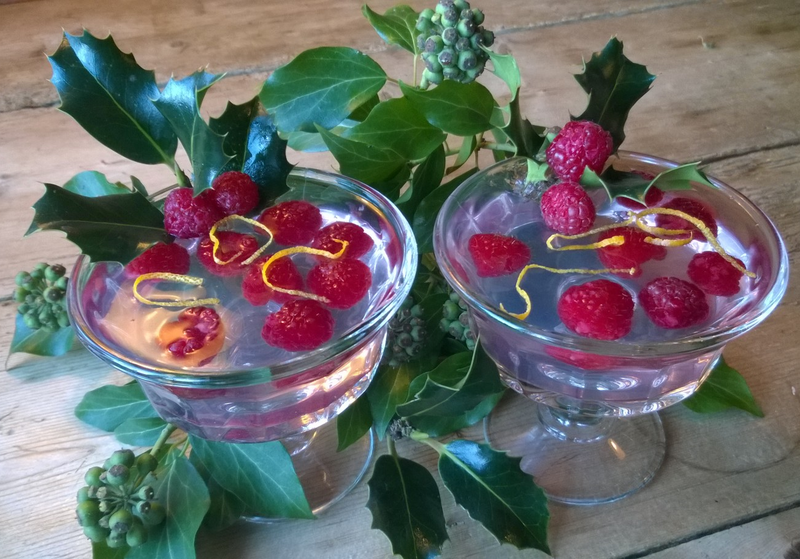 Whichever you choose, add a few raspberries to each glass and ladle in the G&T mix right to the brim. If you’re feeling extra special, you can do this in stages so that the raspberries appear to float in the mix. If you fancy doing this, pour in a little of the liquid, add a couple of raspberries then chill that layer in the fridge for 20 minutes so that the fruit sets at that height. Then repeat the process with another layer, until you reach the top of the glass. To do this, you’ll need to keep the gelatine mix at room temperature, so that it doesn’t set between layers. For this particular occasion, I opted for an all at once approach. I find the results just as beautiful (and far more straightforward), if you allow the raspberries to float to the top. I’ll leave it up to you to decide which route you go for. Once the glasses are full, chill well in the refrigerator over night. Immediately prior to service, top with a couple more raspberries and a sprig of holly. I also zested an orange and draped this over the top for a little bit more colour. As always, this is entirely optional. There you go; your elegant dessert is now complete. A bit of candle-light will bring out an electric blue tinge to the gin. This adds to the charm and creates a further sense of wonder. Enjoy! Christmas is a time of decadence and indulgence. Puddings lie at the very heart of this; so much so, that Christmas wouldn’t be Christmas without them! Desserts form an integral part of the seasons’ rich culinary heritage, and on a low-carb diet, things are no different. Traditional ‘festive fare’ must be hearty and plentiful. In this dish, rich flavours such as brandy & cocoa combine with fresh cream & dense ground-almonds to create a taste that’s the ultimate in luxury. The roulade-sponge has a ‘moreishly’ chewy texture, which is complimented perfectly by the smoothness of the cream filling. In short, the whole thing is delicious from start to finish! 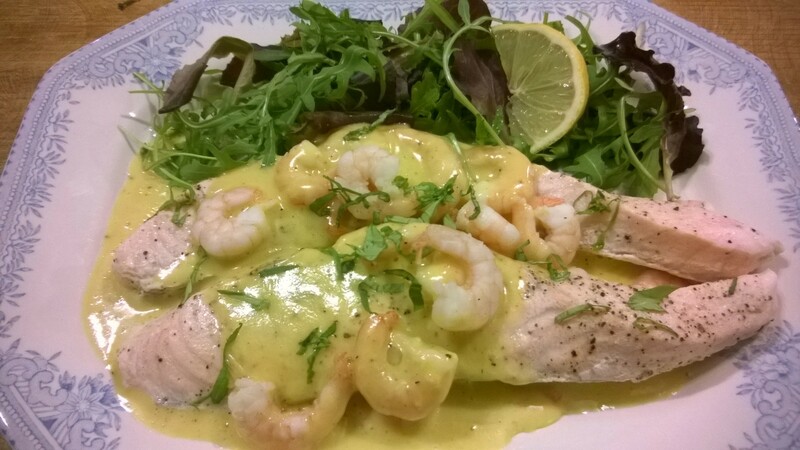 Because there’s no sugar or flour in this dish; diabetics, gluten-intolerants and ketogenic-dieters needn’t miss out on the fun. They’ll be no impact to your blood-sugar, and those trying to lose weight needn’t deliberate before helping themselves. The keto-diet is an amazing thing – it’s hard to believe you can eat this and still slim down. Well take my word for it – you can! To make the roulade base, separate 4 eggs, reserving the yolks for a future low-carb custard or delicious omelette. Tip the whites into a clean mixing-bowl and whisk with an electric-whisk unto they form delicious snowy clouds. These should be stiff enough to retain their shape when you turn the bowl upside down over your head! If not, have a quick shower and start again. Slowly sprinkle in 8oz of xylitol granulated sweetener, whisking at intervals to incorporate it into the egg whites. This will leave you with a mix that’s robust, but has an opaque glossiness. Into this, fold 2oz of ground almonds, 1 small teaspoon of white-wine vinegar, and 1.5oz of cocoa powder. Why the vinegar? This leads to a lighter meringue, as the acid slows down coagulation of the egg-protein. What does that mean? The meringue structure is improved & collapses less slowly. This means you get more time to whisk in the air, and the the egg-white ‘supports’ the other ingredients better due to its increased strength. It really does make a difference. Trust me! With a spatula, scoop the mix into a lined baking tray and flatten roughly, making sure the meringue gets into all the corners to give you a perfect rectangle. Put this into a medium oven and bake for 30-35 minutes until the surface is slightly browned and feels ‘set’ to the touch. Remove from the oven and leave to cool thoroughly to room temperature. If it’s not sufficiently cool, your cream will everywhere and that would be a waste of all your efforts! Meanwhile, pour approximately 200ml of double-cream into a mixing-bowl and add a good glug of brandy. Sprinkle in two tablespoons of powdered table-sweetener and whisk until the cream is firm and spreadable. If you like, you can add a little finely grated orange zest, but that’s entirely a matter of preference. Measure a piece of tin foil to just bigger than your roulade, place this over the top and invert the tray onto the foil, with an impressive ‘flip’. This is not for the faint-hearted! Do it in one go with a a staunch fortitude. If you fuss over it, or try to turn the dish slowly, there’s far more chance it will break or you’ll drop it. So have courage and do it in one! If anyone in the house has a drum, suggest they perform a drum-role whilst your psyching yourself up. It may help (it may not…!). Either way, you should end up with a neat rectangle on your tinfoil. Slowly peel off the back lining and you’re ready to spread your cream filling. With a palette-knife, scrape on your brandy-cream and smooth it evenly across the surface. Then taking the back edge by each corner; roll the roulade towards you, folding the meringue onto itself inch by inch. With each fold, it’s best to press the roulade down slightly so that it sticks to itself. Eventually, you’ll end up with a fine ‘cigar-style’ swiss-roll. If there are cracks, do not worry, we’re icing the top so a little texture along the way can only add to its character. Transfer this to your serving-plate and pause to look on with pride. In the same bowl you used to whip up your brandy cream, pour a further 100ml of double-cream into your bowl and add a tablespoon of powdered sweetener. Measure in the same quantity of cocoa-powder and whisk the lot, until you have a nice firm frosting. 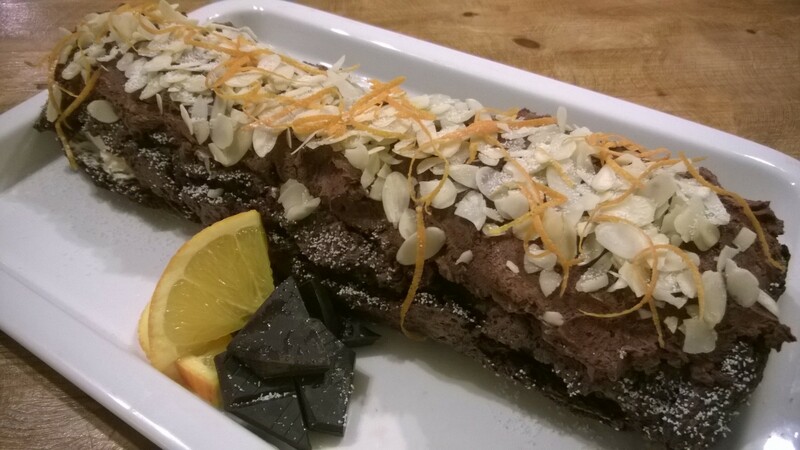 Spread this with your palette-knife across the top of the roulade, then sprinkle the top with flaked almonds and generous curls of orange zest. In place of icing-sugar, a light dusting of powdered sweetener will add the final touch of festive cheer and magnificence. Voila – your roulade is ready for the table. This dish is every bit as delicious as it looks. You’d never know it’s low carb! Be sure to keep reading for more festive recipes over the coming weeks! Check out The Low Carb Christmas for details. 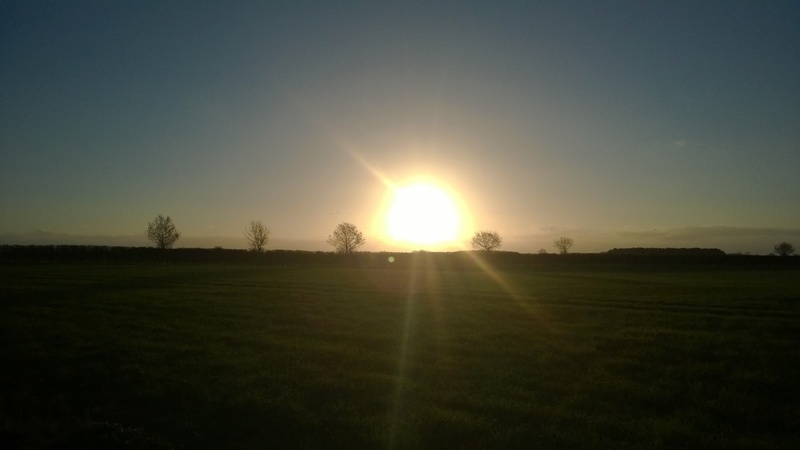 This morning, the sun hangs like a giant, splendid ball of fire against a cloudless blue sky. Despite its best efforts, there’s none of a fire’s comforting warmth. The air is crisp and clear, with a cutting bite, that warns all to dress up warmly. I’m not alone on my dawn walk today. Six fallow deer are feasting on the rich green carpet of winter barley that’s pushing up valiantly through the icy ground. As they sense me coming, they sail away, like carousel horses, gracefully rising and falling to the stately cadences of some silent waltz only they can hear. Theirs’ is an elusive beauty; as timid and shy as the creatures themselves. And so free! So effortlessly free! I often think they must mock my ungainly stomping, as I march round the field, clad in thick jumper, scarf and Wellingtons. As they glide off into the distance, I wonder if they too are in awe of the natural beauty which surrounds them… I’m sure they must be. For it is their world, I’m simply an intruder, just passing through. There one minute, gone the next. Whatever you get up to, be sure to venture outside and enjoy the day. For it is perfect. Well, I’m nine weeks in now. Just to remind you all, I started the ketogenic diet at 15 stone, 10 pounds. My goal is 12 and a half stone, by mid-March 2015. This means a target weight-loss of 2lb per week. Week Nine’s target-weight therefore? 14 stone, 6 pounds. It’s also the second of my once monthly ‘waistline measurements’ today, which is always nerve-racking! When I started the diet, my waist-circumference was 45 inches. All the the health-literature states that if your waist is above 40 inches, then you enter the danger-zone for developing coronary heart disease, high blood pressure and diabetes. This is something I am keen to avoid; plus I hate the ‘pot-bellied’ look, which was starting to creep in. On the health front, my partner is a type 1 diabetic; so if I developed type 2 through poor lifestyle choices, then that would be a slap in the face to both him and me! The tape-measure Is a different kettle of fish entirely from the weighing-scales! With regards weight, there’s no ‘negotiation’ in the process. The scales say what they say, there’s no getting out of it! The tape-measure is a little more open to interpretation. A series of questions present themselves – have I measured at exactly the same point as last time…? Is the tape completely level…? Am I breathing in too much; or have I pushed my stomach out artificially to capture the ‘worst case scenario’…? It is an exercise in frank self-honesty, which is never easy. And so I stand in front of the mirror & ask myself all the above questions. I look down at the tape, ‘hum & ha’ a little, then take the average of about 10 measurements – 43 inches definitely! I’ve lost two inches from the circumference of my waistline, which is fantastic! Just three more to go before I’m out of the danger zone. This ‘waist-shrinkage’ also accounts for the fact that everyone’s saying ‘I’ve lost a lot of weight’. My trousers are sitting far more comfortably, and a belt-notch has gone down (I love when that happens). 14 stone, 10 pounds. Another pound off! The downward trend is continuing and this week’s reading presents a 1lb weight-loss from last week. I may be 4lb behind target, but that really doesn’t bother me. I’m losing weight and that’s all that counts. I’m now a full stone lighter than I was nine weeks ago. The one-stone milestone has been crossed!!! A lot of people have said to me that the body can only tolerate a 1-2 loss per week. These figures would support that statement, which is positive. The ketostix are still showing a dark purple a lot of the time, so I can be sure that the weight-loss is body-fat; not just water! Am I experiencing diet-fatigue? Not at all. The ketogenic-diet is incredibly easy to follow. The food is delicious and varied, so much so that this in no way feels like a diet! The plan is to eat liberally from the ketogenic ‘food pool’ and not worry about portion-size or cutting things out. That’s certainly what I’m doing, and I’m still losing weight. In summary, I’m feeling incredibly motivated and wouldn’t go back to old my old ‘carb-ridden’ ways for all the tea in China! My one big challenge will be an impending holiday. I’m off to Germany to visit the Christmas Markets in 10 days, and that will be hard. Germany is the land of beer & carb-laden foods, so I anticipate I may waiver a little and partake in some mulled-wine and wonderful German beer! Until then however, my resolve is firm! Please do ‘look in’ on me next week to see if I make further progress towards my targets. I find it really positive to have people read this – the support is a massive encouragement! 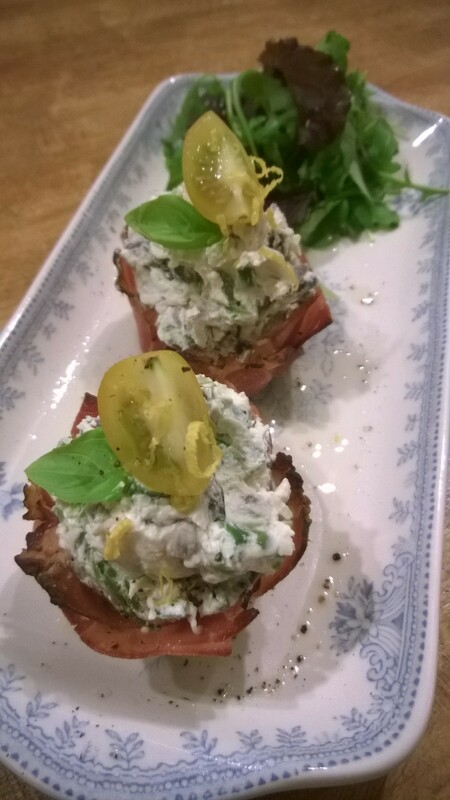 The Low Carb Christmas – Red Onion, Asparagus, Parmesan & Cream Cheese ‘Parma-Ham Tartlets’ with Truffle-Dressed Leaves. 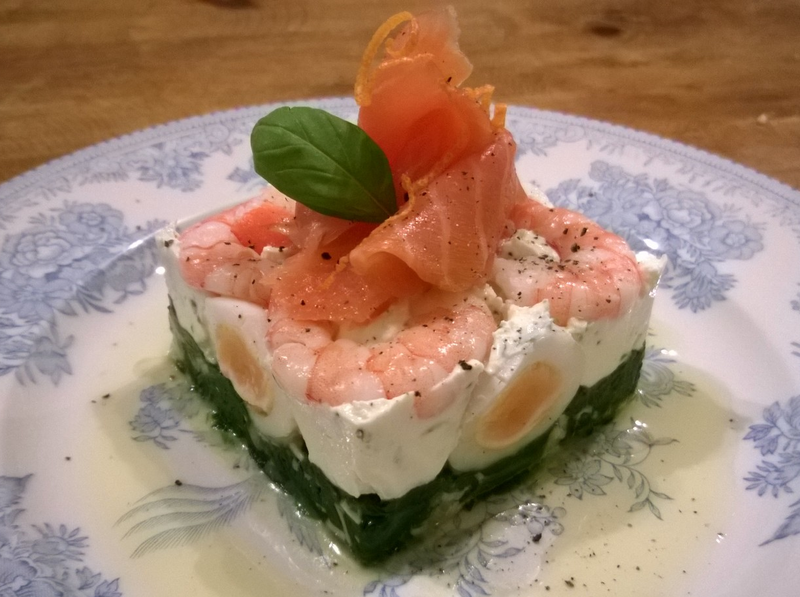 A festive Christmas starter that tastes every bit as good as it looks! Christmas is a time of joy and plenty. Of nowhere is this more true than the festive table. In this wonderful season, food comes into its own and proudly takes centre stage. And behind every stage must lie a theatre; in this instance, that theatre is the kitchen – the true heart of every home. 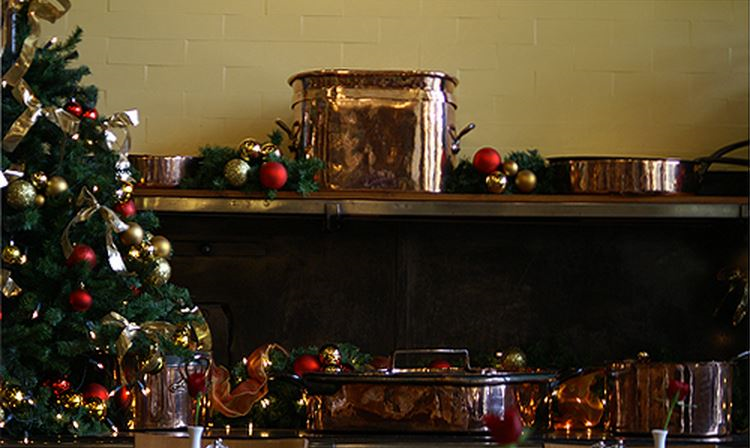 With its gleaming copper pans and lovingly scrubbed oaken-table, the kitchen becomes a place of unrivalled magic at Christmas. There are so many delicious things to prepare that the cook is spoilt for choice; so much so, that selecting the perfect dish becomes more of a challenge than cooking it! When I began the ketogenic-diet, I was slightly concerned that my kitchen would lose its magic. There’d be no more rolling of pastry or slow rising of bread. But instead of narrowing my repertoire, the low carb diet has expanded my horizons and pushed me to try new things. That must be a benefit! With a little imagination, the low carb kitchen can yield a stunning diversity. Take these tartlets for example. They require none of the fiddly mess of pastry, nor induce the ‘bloat’ it brings on. They’re perfect for diabetics or those with a gluten-intolerance; not to mention those on a low-carb ‘keto-plan’ (like me!). Such dishes may look complicated, but it doesn’t follow that their preparation should be either arduous or stressful. This recipe is incredibly simple & is perfect for a Christmas starter or light brunch. It can be made ahead of time and assembled at the last moment; a real boon on Christmas day, when time has a habit of running away with itself! The first thing to tackle is the parma-ham tart-cases. Lightly oil a muffin tray or Yorkshire-Pudding tin. Cut your parma ham into lengths which just sit proud of the surface. This allows for shrinkage. Two slices per tartlet should be sufficient. You can use the trimmings to plug any gaps you have, to create a seamless shell. Into a hot oven they go for 10 minutes max. You want the sides to be ever so slightly brown, but not too crisp. Once done, take out of the oven and leave to cool. Meanwhile, slice your asparagus spears into very thin rounds. Boil these for one minute in a shallow pan of water. I added half a stock-cube to this, plus a small ‘crush’ of garlic to provide background flavour. After the time has elapsed. strain the liquid and refresh your asparagus under the cold-tap to arrest the cooking process. Finely chop a red onion and sauté in butter until soft and translucent. Then remove from the pan, and lay thinly on a plate to cool. The trick is as follows: the greater the surface-area of your plate, the quicker the cooling time! Grate a little parmesan cheese into a mixing-bowl and sprinkle a generous spoonful of chopped basil on top. Once your asparagus and onion are at room-temperature, add these to the bowl and season well. Stir in an equal quantity of cream-cheese by eye and loosen the mix with a quick pour of double-cream and squeeze of lemon-juice. The texture we’re looking for like a mousse. If it’s too solid, ad a little more cream. Taste the mix to adjust for seasoning, then spoon into your cooled tart-cases, piling the mix up in a generous mound. This is no time to scrimp! Top the tartlets with a thin slice of tomato & lemon-zest, then garnish the dish with fresh salad-leaves. Though in no way essential, a drizzle of truffle-oil finishes the lot to perfection! Don’t worry if you can’t get hold of this – a good vinaigrette will serve just as well. Either way, the results will be flawless! Be sure to keep reading for more festive dishes over the coming weeks! Check out The Low Carb Christmas for details. Enjoy the festive season and thank you for reading.